You guys, I am so excited for the new Sailor Moon show coming out in July. A few copies of my little sister’s sailor moon comics were my first introduction to manga, and are what got me interested in art in the first place. I even dreamed of being a comic artist for a while! I’m sure if I looked around, I could find some of my old comics, but I’m not sure if I want to. Anyway, I’ll be at the Sailor Moon tribute show in Anaheim with bells on. 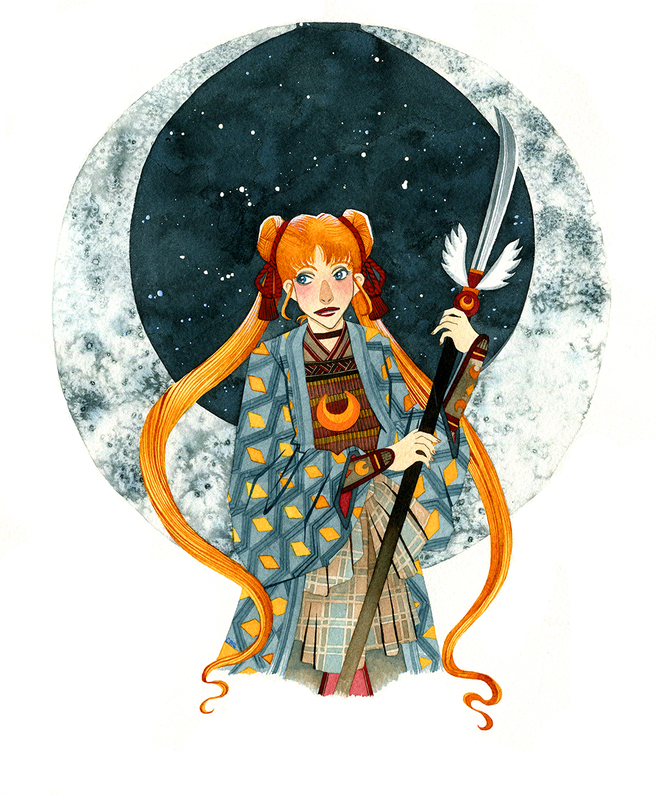 Even though I’m not participating, I thought it would be nice to do my own tribute to Usagi and the series that got me started. 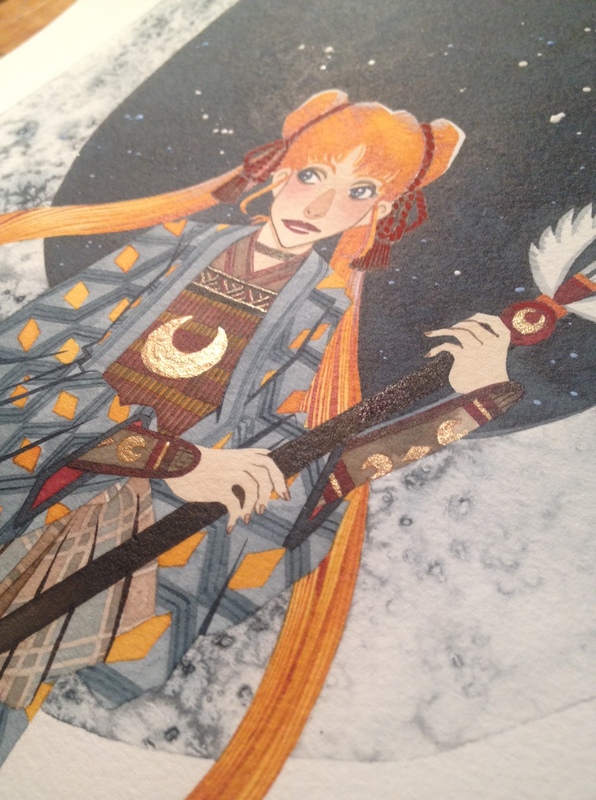 Sailor Moon as an Onna bugeisha, or female samurai. I went back a little later and added some gold accents. She’s completely painted in ink, with a few gouache touch-ups. The more freedom I give myself to mix colors, the easier painting with ink becomes. I wanted to emulate some of the lines and shapes found in old woodblock prints of warriors. Edit: I’ve had a few inquiries, so I’ve made the original painting and prints available in my Etsy shop. I love everything about this illustration. Love it! I definitely think the gold accents add to the success of the piece. What paint medium do you use? Thank you! I mainly use Winsor & Newton calligraphy ink, occasionally mixed with Dr. Ph. Martin’s Bombay India ink. And small touch-ups in gouache from a student set I’ve had for a few years. Wow! I use ink too but I have nowhere near the control over it as you do in terms of achieving tonal range. I’m very impressed. I’ve definitely been forcing myself to practice over the last few months! Well I’m just an amateur artist but one with decades’ of experience and I’m definitely impressed. I love your style as I also draw in quite a graphic, “cartoon” / illustration style (not sure how to describe it so I’m using words people have used about my drawings). I look forward to seeing what you do next. This is the coolest thing! !